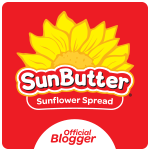 Looking for 100% nut free, organic, GMO free soy butter? How about one that offers a Chocolate and Cinnamon Sugar Soy Butter option? NUT-FREE equipment, NUT-FREE facility and NUT-FREE packaging! Guaranteed NUT-FREE, a "Field to Fingers Nut-free Process". These will be a welcome addition to many food allergy homes. Don't Go Nuts Nut Free Foods, a division of Pinto Barn, 123 G. Street, Salida, CO 81201. I was fortunate enough to be contacted by this company to try out their Don't Go Nuts Soy Butters. Having nut-allergic kids myself, I couldn't wait to try these out. They sent me 3 of their 5 varieties: Chocolate, Cinnamon Sugar and Lightly Sea Salted. I must admit that when I first saw the 'Chocolate' option, I didn't think it sounded very appealing. Needless to say, it has turned out to be my family's favorite! Don't Go Nuts and Pinto Barn founders, Jane and Doug Pinto, were inspired to serve the needs of millions of children who have a life-threatening allergy to peanuts and tree nuts because of their own daughter's experiences and needs. Their passion and commitment to keeping kids with nut allergies SAFE runs deep. Be sure to visit their websites to learn more about this socially conscience company, and how and why their commitment is to providing socially responsible products. 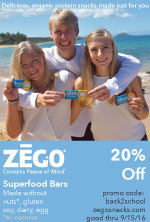 They offer nut-free nutritional energy bars too, but more on them later!